You can do without a staircase only in a one-story private house, and even then, if there is no attic in it. This extremely important building element guarantees safety, convenience and comfort for the occupants, and therefore its production is a very responsible task. But before taking up the tools, it is necessary to calculate the ladder, taking into account all the nuances associated with it. Otherwise, all the work on arranging a reliable transition from the floor to the floor of the house may be useless and the master will be forced to redo the entire structure. 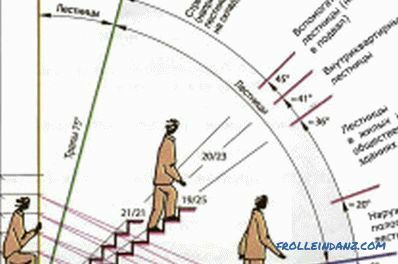 In order to carry out a thorough calculation of the stairs according to all the rules, a number of points should be taken into account. Scheme of the new staircase on the kosour. First of all, the clearance between the surface of the first (lowest) stair and the interfloor overlap (for a one-frame structure) or between the top of the first stage and the bottom of the last (highest) stage (for a rotary or screw design) it may be less than 2 m. Otherwise, a person walking upstairs may get a head injury. It is recommended to install the stairs to the second floor of the house so that it has an inclination angle of 35-40 degrees after installation. With a slope of more than 45 degrees, walking on it becomes difficult physically (especially for children and the elderly), and even unsafe. When the device is more flat design, its size will increase, and the manufacture will have to spend more money and building materials. You cannot make the flight of stairs too narrow, even if the staircase itself is short. The width of the march should be at least 0.9-1 m.
All stair steps should be the same size. But if for some reason it is not possible to withstand one-dimensionality, then it is necessary to adhere to the rule that the difference between the heights of individual steps cannot exceed 0.5-1 cm. 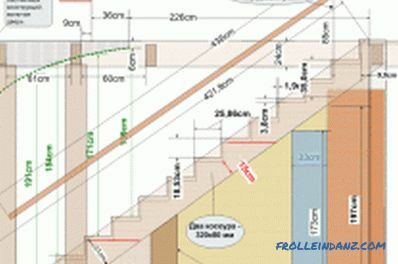 We cannot allow the side clearance between the flight of stairs and the wall was greater than 6 cm. There are standard minimum and maximum sizes of stairs for a house consisting of one march - the most common variant in private housing. Calculated data for kosour marking. At the same time, it is assumed that any flight of stairs consists of the lower frieze step (located at the height of one riser from the floor level), the upper frieze step (its plane is exactly at the same level with the floor plane of the upper floor) and a certain, arbitrarily specified number of intermediate steps. A march with a minimum number of stages consists of 3 stages, with a maximum - from 15-16, in some cases from 20 stages. The span is considered to be averaged, in which there are 8-12 steps. For the safety of users, stairs in a private house should be constructed on such a basis that they are able to withstand a weight of about 220-240 kg and their handrail should be at least 100 kg. When making a handrail, you should adhere to the following standard sizes: height - not less than 90 cm (70-75 cm for a children's room), width - 10 cm. If the flight of stairs to the second floor is adjacent to window opening, the window must be protected by railings. In order to perform a full calculation of the stairs, it is necessary to establish a unit of such a calculation. It is considered to be the length of a person’s step. The size of the average step of an adult person is usually about 60-64 cm. According to the findings of scientists, it is to this length that the human foot is taken out at each step during its movement without acceleration along the horizontal plane. And it is the specified length of one step that is automatically transferred to the mechanics of walking along the spans of any staircase. But the calculation of a person’s step along the steps of a ladder has its own characteristics. In particular, starting from this parameter, you can use a certain formula to set the height of the step (riser) and its width (tread), as well as the necessary relationships between these values. sz - tread width (cm). 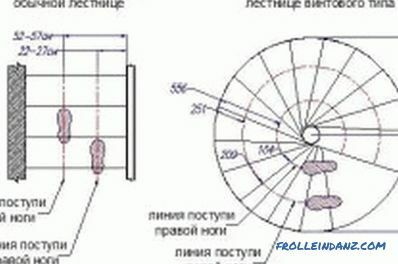 Thus, the master performing the ladder calculation can quite easily calculate the indicated values ​​and get a result that will correspond to the normal, stable, without stress and the risk of an accidental drop in the movement of a person up or down. 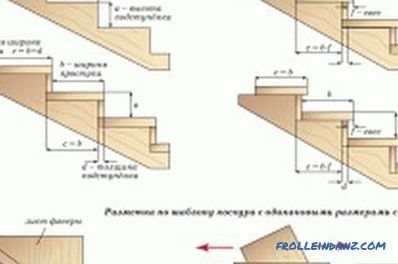 For example, fixing the size of the riser (in fact, the vertical distance between two adjacent steps), according to the above formula, the width of the step itself is established without any problems. It is worth noting that this ratio is most often used - 16–17 cm (the size of the vertical riser) to 29–30 cm (the size of the horizontal tread). 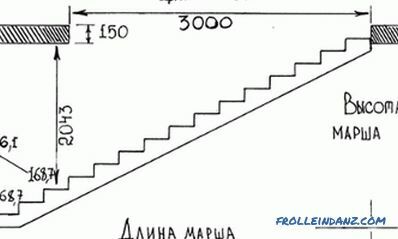 Calculation of the optimal angle of inclination of the stairs. The determination of the dimensions of the stairs to the second floor in a private house should be carried out taking into account the height between the ceilings and the space of the room left free for the construction of this structure. At the initial stage, the shape of the ladder is selected. The master can equip an interfloor transition of any configuration in his house, but most often they prefer the simplest, most reliable and convenient form - a straight single-front construction connecting two floors. Usually such ladders are mounted in a house whose height is from 2 m to 3-3.5 m.
In order for this element of the home interior to be easy to use, it is necessary to ensure free space under the planned flight of stairs. To make the correct calculation of this space, one should proceed from the 2: 1 ratio between the length of the flight of stairs and the height of the room, which is considered optimal. This means, for example, that when the staircase to the second floor is 3 meters in height, its maximum length for walking should be 6 m.
As for optimal steepness, in a private house it can be almost any what the landlord would like. But experienced experts recommend choosing an angle somewhere between 30 and 40 degrees. A steepness of less than 30 degrees from a functional design will make a too large and inconvenient ramp, and an angle of more than 40 degrees is dangerous with falls and injuries of people. Considering the basic parameters of the stairs, it is worthwhile to dwell on the width of the march. As mentioned above, the minimum width should be 0.9-1 m. But if it is known that several people will use the staircase at the same time, it must be expanded to 1.2 m. However, in exceptional cases (for example, when the area of ​​the room is too small, and one cannot do without lifting to the upper level), the width of the staircase is allowed at 0.7 m.
Calculation of a spiral staircase. Wooden spans are often built in a private house. They can be calculated by the same method as the stairs from another building material. But since wood does not have such strength as, for example, metal or concrete, in the case of a straight wooden march it is desirable to mount a string (prop) in its middle. Such an addition will certainly strengthen the entire structure, guaranteeing it from deflection. When calculating the spiral staircase to the second floor, one should take into account, in particular, the intensity of its use. 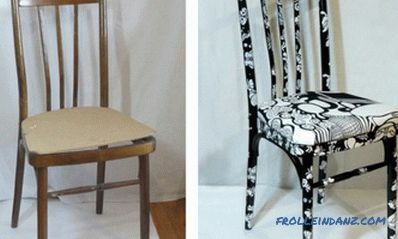 If the design is operated infrequently, then when you create it, you can focus on decoration. 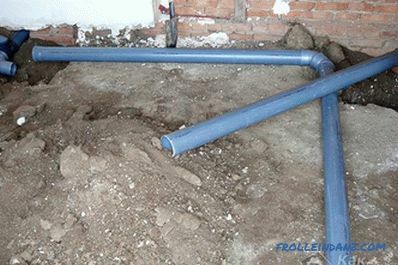 But if it is used regularly and intensively enough, it is necessary to take care of the strength of the materials for its foundation. 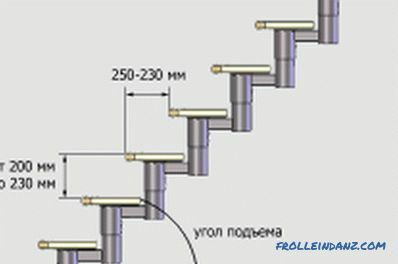 In addition, it is recommended that the steps of such a staircase, having the shape of a cone, have a width of 20-25 cm in the middle part, and in the widest (outer) part - up to 40 cm wide. Meanwhile, the customer may want build in his house a swinging staircase. 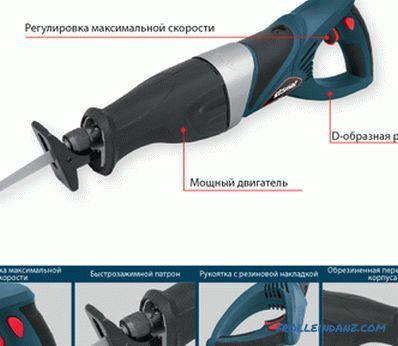 It resembles in part a dvuhmarchevuyu design, but here the role of an intermediate platform perform turning degrees. 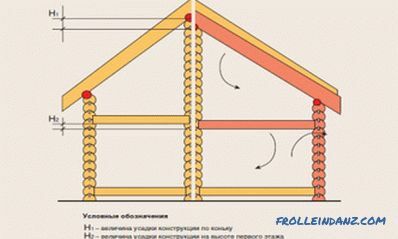 When calculating the ladder, the master should proceed from the distance from the first to the second overlap, from the general stylistic layout of the interior, free space for convenient installation, and also from the total number of marching and turning stages. It should be borne in mind that the most optimal number of rotary stages is considered to be no more than 3 pieces. Thus, having become acquainted with the rules and some features of a relatively simple process, you can try to equip your home with a simple and reliable device that will make everyday life comfortable and safe.